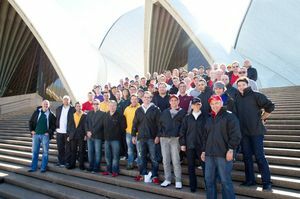 Capital S.M.A.R.T recently held its second annual conference for the leadership teams from all sites in Australia. Capital S.M.A.R.T Chief Executive, Norman Moss said the focus for this year's event in Sydney was to inspire all teams around continuous improvement in product development, technology and quality repair practices, which would further enhance the customer experience. "A number of key initiatives will be rolled out in the coming months as part of our ongoing investment in improved processes, technology and workflow, and it's important for our teams to understand the significance to our business and their role in in the implementation of these developments," Mr Moss said. Around seventy delegates, about fifty from interstate, were involved in this year's event, which involved a morning conference at Sydney's iconic Opera House, team activities on Cockatoo Island in the middle of Sydney harbour, and the awards dinner at the Museum of Contemporary Art. The winner of the Best Repair Centre Large was Coburg (VIC), with Bentleigh East (VIC) and Seven Hills (NSW) the other finalists. Holden Hill (SA) won the Best Repair Centre – Medium award and the other finalists were Hallam (VIC) and Lansvale (NSW). Seven Hills won the Safety Award. In the PPG Paint Excellence section, Holden Hill was the Best Maintained Centre, David Purves from Knoxfield (VIC) took out the award for the Most Improved Painter and Trifon Vais from Seven Hills won Most Supporting Manager. Andy Bird and Jim Vais were presented with Special Recognition Awards for their contribution to the growth and development of Capital S.M.A.R.T. Mr Moss said the awards had an important role in inspiring everyone at Capital S.M.A.R.T to seek world class performance and service. "The awards recognise what is being achieved by our Repair Centre Teams along with individual team members as the Capital S.M.A.R.T business continues to evolve," Mr Moss said.